(1986)Project: Driver is a studio album by the super group M.A.R.S., which was released in 1986 through Shrapnel Records(United States) and Roadrunner Records(Europe). The band's name is made up of the initials of each musician's last name: guitarist Tony MacAlpine, drummer Tommy Aldridge, singer Rob Rock and bassist Rudy Sarzo. Craig Goldy was the original guitarist, but he left after joining Dio. What you have when Rob rock and Roy Z team up is a dynamic duo with Rob Rock being best known for his work with Joshua, Impellitteri, Warrior, and of course all his solo albums. Roy Z is an acclaimed guitarist/producer that has worked with Bruce Dickinson, Rob Halford, Judas Priest and Helloween. 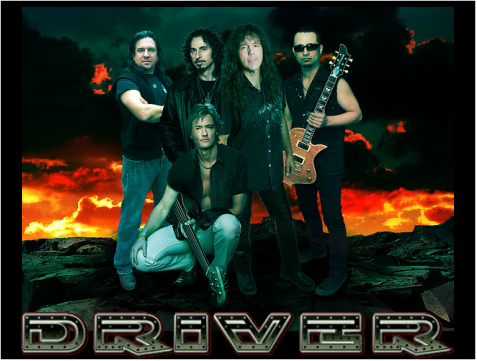 Driver released an EP in 1990 being self-titled, it featured Rob Rock-Vocals, Roy Z-Guitars, Emil Lech Brando-Bass, Greg Shultz-Keyboards, and B.J. Zampa-Drums. Sadly, Driver didnt get picked up by a major record label due to the emerging Grunge Rock scene of the 90's. All of the songs on this EP were reused on the 'Sons of Thunder' album 8 years later. Rob Rock and Roy Z got back together in 2008 and re-recorded the songs on their EP release and 7 new songs as well. They went with Metal Heaven Records and released a full length album called 'Sons Of Thunder' which has some killer guitar riffs by Roy Z and Stunning Vocal work by Rob Rock. The Guitar work always sounds crisp and fresh with each listen. This album was produced by the one and only Roy Z himself, showing that he can do even more than just play a mean guitar. Our dynamic duo Rob Rock & Roy Z continue with a new release in 2012 called 'Countdown'. If you liked "Sons Of Thunder" then you will find a lot to like here as well. Driver seems to follow closely to the rule of thumb which is- If somethings not broke then don't try and fix it. A lot of bands think that with each release they need to be harder & heavier which only puts more stress on the band and ultimately ends in their demise. Hopefully Driver will continue to release albums in the near future as their music is well needed in the christian music scene. Also if I might add Rob please put 'Countdown' on iTunes! Thanks. If you love "Proper" Power Metal then don't hesitate in picking up a copy or two by Driver and sit back and listen to some quality Metal Music by some of the best!